Marilyn Monroe's career as an actress spanned 16 years. She made 29 films, 24 in the first 8 years of her career. Born as Norma Jeane Mortenson on June 1, 1926 in Los Angeles General Hospital, her mother, Gladys, listed the fathers address as unknown. Marilyn would never know the true identity of her father. 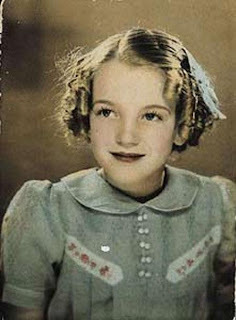 Due to her mother's mental instability and the fact that she was unmarried at the time, Norma Jeane was placed in the foster home of Albert and Ida Bolender. It was here she lived the first 7 years of her life. "They were terribly strict...they didn't mean any harm...it was their religion. They brought me up harshly." In 1933, Norma Jeane lived briefly with her mother. Gladys begin to show signs of mental depression and in 1934 was admitted to a rest home in Santa Monica. Grace McKee, a close friend of her mother took over the care of Norma Jeane. "Grace loved and adored her", recalled one of her co-workers. Grace, telling her..."Don't worry, Norma Jeane. You're going to be a beautiful girl when you get big...an important woman, a movie star." Grace was captivated by Jean Harlow, a superstar of the twenties, and Marilyn would later say..."and so Jean Harlow was my idol." Grace was to marry in 1935 and due to financial difficulties, Norma Jeane was placed in an orphanage from September 1935 to June 1937. Grace frequently visited her, taking her to the movies, buying clothes and teaching her how to apply makeup at her young age. Norma Jeane was to later live with several of Grace's relatives. grimness. The whole world seemed sort of closed to me...(I felt) on the outside of everything, and all I could do was to dream up any kind of pretend-game." In September 1941 Norma Jeane was again living with Grace when she met Jim Dougherty, 5 years her senior. Grace encouraged the relationship and on learning that she and her husband would be moving to the East Coast, set in motion plans for Norma Jeane to marry Dougherty on June 19, 1942. "Grace McKee arranged the marriage for me, I never had a choice. There's not much to say about it. They couldn't support me, and they had to work out something. And so I got married." inspecting parachutes in 1944, was photographed by the Army as a promotion to show women on the assembly line contributing to the war effort. One of the photographers, David Conover, asked to take further pictures of her. By spring of 1945, she was quickly becoming known as a "photographers dream" and had appeared on 33 covers of national magazines. In the fall of 1946 she was granted a divorce...later saying, "My marriage didn't make me sad, but it didn't make me happy either. My husband and I hardly spoke to each other. This wasn't because we were angry. We had nothing to say. I was dying of boredom." On July 23, 1946 she signed a contract with Twentieth Century-Fox Studios. She selected her mother's family name of Monroe. From this point on she would be known as Marilyn Monroe to all her fans. She had a minor part in the movie "Scudda-Hoo! Scudda-Hay! and was dismissed as a contract player in August. Rehired in 1948, Marilyn sang here first song in the movie "Ladies of the Chorus".